Laundry Queen to the Rescue! Iron Out was recommended to me by a fellow softball mom about 13 years ago. At one point, I had my daughter and my son both playing competitive softball and baseball with coaches that LOVED white pants!! On Sunday evenings I had at least 6 extremely dirty uniforms of all colors, socks, sliding pants soaking in Iron Out all night and could throw in the wash the next day to come out looking like new!! 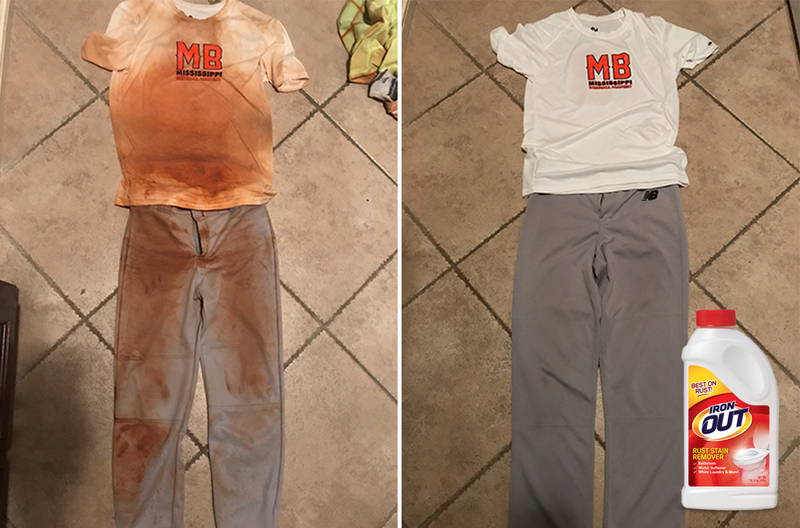 At one point in my daughters years of playing, I got so disgusted at all the teams uniforms never looking clean, that I took the entire teams uniforms and socks to get them looking white again thanks to Iron Out!! The pictures above are my sons uniform from this past weekend. The opposing team was trying over and over to try and pick him off at first base. He plays hard and is always dirty but this was one of the dirtiest. During a break from games, I had several parents and people asking me how I would ever get this clean again, my answer… Iron Out! Thank you for your amazing product! !